The ecological and social implications of climate change have – or should – become a central parameter for all discussions of work and capitalism. It is generally agreed that reliance on the burning of fossil fuels as the pre-eminent energy source for production and consumption over the history of capitalism is the critical factor in the ruinous greenhouse gas emissions triggering global warming, which would become irreversible if the earth’s atmosphere were brought to a ‘tipping-point’. The leading scientific estimates project that a rise in average global temperatures of 2°C (and now often just 1.5°C) is the threshold for irreversible climate change; that this can be expected from an accumulation of 1 trillion metric tonnes of carbon in the atmosphere; that we are approaching 600 million tonnes; and that the carbon ‘tipping-point’ may well be reached in 30 years unless carbon emissions can be reduced by 2-5% per year (and now often even more severe reductions). 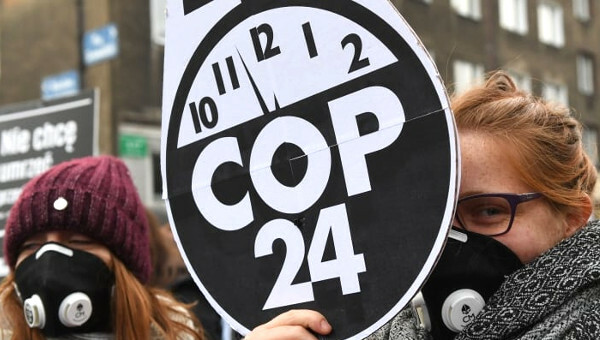 The unrelenting build-up of greenhouse gases has led to the jarring conclusion, drawn by climatologists, ecological militants and union activists, that an exit from reliance on fossil fuels for energy needs to occur with some urgency. Here, the market mediates the collective interaction and metabolism with nature that occurs with capitalist production. For each individual capitalist, the primary goal of investment and production is to realise profits, rather than satisfying human needs consistent with ecological sustainability. In this sense, both workers and nature are brought into the production process simply as inputs, as a means to another’s end. In this process, workers lose control over the products of their labour, the labour process itself, and the interaction with nature that this entails. In short, work within capitalism is, at its core, an experience of exploitation and alienation. As the social surplus that results from production is owned privately, decisions on the direction of investment (say, to move from fossil fuels to solar power) also lie in private hands rather than involving workers affected or being democratically decided. Some may be surprised to see how the economic crisis has re-invigorated neoliberal politics (of freer markets to increase the profits and power of capital) in the form of a strategy of ‘permanent austerity’ imposed on the public sector and workers. An agenda of ‘green growth’ to address climate change, best laid out in the United Nations Environment Programme’s (UNEP) Towards a Green Economy, and the United Nations (UN) report for the 2012 Rio+20 summit, Working Towards a Balanced and Inclusive Green Economy, has emerged as a core feature of neoliberal renewal. 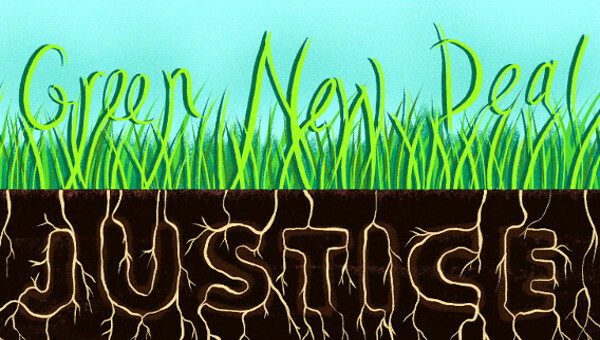 The environmental crisis, the reports contend, is fundamentally a problem of a “gross misallocation of capital.” The full suite of neoliberal proposals, now with a ‘market ecology’ twist, are offered: removal of subsidies in agriculture; privatization of public utilities to impose market discipline and prices; public-private partnerships with full-cost recovery in the guise of ‘polluter pays’ pricing; leveraging ‘green’ private investment to rebuild with carbon-reducing public infrastructure; promotion of free trade and intellectual property rights to encourage trade and growth in ‘green’ products and technology transfer; to name but a few. Remarkably, in light of the financial crisis, they propose to encourage more financialization: that is, the predominance of financial markets in driving carbon reduction investments through the development of ‘green’ financial instruments. For instance, the insurance industry, given its experience with managing risks in general, is now touted as the best driver of the ‘green economy’, given its capacity to ‘price in’ environmental risks. This will encourage, so the market logic goes, preventative measures and shift relative prices favourably toward ‘green’ production. incorporation of carbon reduction strategies within collective agreements through clauses on reductions of the carbon footprint, energy committees, and adjustment plans for jobs impacted by climate change. workers’ plans forged to extend best-practices for carbon reduction in labour processes and between workplaces. building democratic planning capacities for plant conversion to sustain capital equipment, workers’ skills and community infrastructure as ecologically-responsible production norms are internalized. participatory planning structures built at the level of local wards for carbon reduction and ecological clean-up in neighbourhoods. energy transition entails concerns not only with the phasing out of fossil fuel production (and immediate limits on extreme energy such as the tar sands) and the reversal of neoliberal privatization of power supplies. It also needs to be conceived in terms of ‘energy democracy’: public ownership and control; diversity, decentralization and localization in production and control; and transparency and accountability in ecological impacts. For the most part, renewable energy production also fails miserably on all these accounts. democratization and participatory planning over centralized energy production and supply systems. reduction in the massive capital intensity involved in fossil fuel and nuclear production to give developmental preference to a diversity of direct and local production. redistributive energy supply and pricing strategies. publicly-supported technological transfer to equalize renewable energy access globally. a sharp reduction in standard worktime to share-out work and increase the time for democracy and self-management of workplaces. a shift from private to public transit in electrified systems tied to ‘transit justice’ and ‘free fares’. the extension of de-commodified public spaces in terms of parks, museums and galleries, and cultural and recreational spaces. the mass public expansion of the caring sectors. universalization of free post-secondary education for all age groups. dismantling of military production and mobilization of civil brigades for ecological restoration. boreal forest for the toxic mines of the Alberta tar sands is only the most visible and violent landscape produced by this mode of development. It is ‘capitalism as a system’ that is the central obstacle in the transition to ecologically responsible production, work and energy regime. Marx pointed out in the Grundrisse that capitalism has a general disdain for nature apart from the use-values it can appropriate (and the accumulation regime in Canada particularly commits this sin). And this contempt extends to workers apart from the value their labour produces. “For the first time, nature becomes purely an object for humankind, purely a matter of utility… whether as an object of consumption or as a means of production.” This arises not from whim or malice on the part of individual capitalists, even if overt scheming and greed has always characterized the oil industry. It emerges from the competitive imperatives to maximize profits and thus continually to annihilate space (as both natural and built environments) by the acceleration of time through productivity enhancement (enabled by the energy from fossil fuels). The accumulation of capital is, historically and to this day, the accumulation of carbon in the earth’s atmosphere. 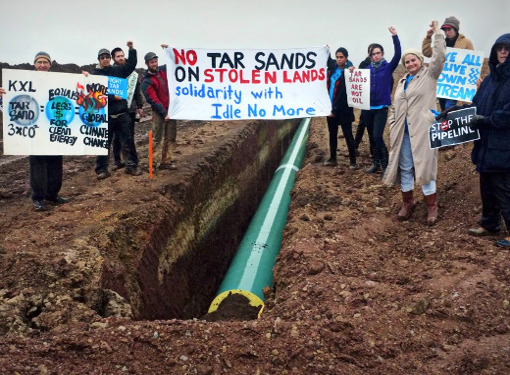 This essay is adapted from A Line in the Tar Sands: Struggles for Environmental Justice (Toronto: Between the Lines/Oakland: PM Press, 2014). Video of the book launch is available at LeftStreamed No. 243. See: J.B. Foster, “James Hansen and the Climate Change Exit Strategy,” Monthly Review , 64: 9 (2013); John Carey, “Global Warming: Faster than Expected?,” Scientific American , November 2012. We refer here to ‘institutional ecology’ to underline the extra-market foundations seen necessary for offsetting structural market failures as with Keynesian political economy in this perspective. In the ecology literature, this is often associated with ‘ecological modernisation’. See: Arthur Mol, David Sonnenfeld and Gert.Spaargaren, eds., The Ecological Modernisation Reader: Environmental Reform in Theory and Practice (London: Routledge, 2009); Maarten Hajer, The Politics of Environmental Discourse: Ecological Modernization and the Policy Process (Oxford, Oxford University Press, 1995). For a critique: John Bellamy Foster, Brett Clark and Richard York, The Ecological Rift: Capitalism’s War on the Earth (New York: Monthly Review Press, 2010), pp. 41-43. On the metabolic relations of nature in capitalism see: John Bellamy Foster, Marx’s Ecology: Materialism and Nature (New York: Monthly Review Press, 2000), Ch. 5. See: Karl Marx, Capital , Volume One (London: Penguin Books, 1976 . Elmar Altvater, The Future of the Market (London: Verso, 1993); Andrea Malm, “The Origins of Fossil Capital,” Historical Materialism , 21: 1, 2013. UNEP, Towards a Green Economy: Pathways to Sustainable Development and Poverty Eradication (Nairobi: UNEP, 2011); UN, Working Towards a Balanced and Inclusive Green Economy: A United Nations System-wide Perspective (Geneva: United Nations, 2011). For ‘market ecology’ strategies in Canada see: Canadian Association of Petroleum Producers, “CAPP on Climate,” 2013 at www.capp.ca/environmentCommunity/Climate; Clare Demerse, Reducing Pollution, Creating Jobs: The Employment Effects of Climate Change and Environmental Policies (Drayton Valley, Ab. : The Pembina Institute, 2011); Chris Bataille, Benjamin Dachis and Nic Rivers, Pricing Greenhouse Gas Emissions: The Impact on Canada’s Competitiveness , C.D. Howe Institute Commentary, N. 280, 2009. UNEP, Towards A Green Economy , p. 14. Green Jobs: Towards Decent Work in a Sustainable, Low-carbon World (Nairobi: UNEP, September 2008), p. 3. The report was drafted by the Worldwatch Institute, but circulated by the UNEP and ILO and differs from the UNEP report a few years later. A few key Canadian interventions being: Tony Clarke, Jim Stanford, Diana Gibson and Brendan Haley, The Bitumen Cliff: Lessons and Challenges of Bitumen Mega-Developments for Canada’s Economy in an Age of Climate Change (Ottawa: CCPA, 2013); Making the Shift to a Green Economy: A CommonPlatform of the Green Economy Network (Ottawa: GEN, 2011); Andrea Harden-Donahue and Andrea Peart, Green, Decent and Public (Ottawa: Canadian Labour Congress/Council of Canadians, 2009). Alex Bowen, ‘Green’ Growth, ‘Green’ Jobs and Labor Markets , Policy Research Working Paper N. 5990 (Washington: The World Bank, 2012), pp. 4-5. 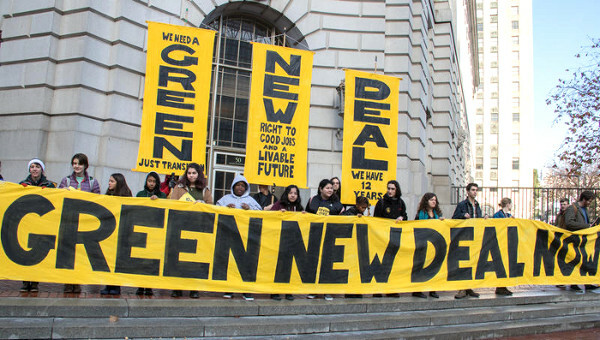 For a discussion of the environmental contradictions of the multiplier effect and other green Keynesian propositions, see: Bill Blackwater, “Two Cheers for Environmental Keynesianism,” Capitalism, Nature, Socialism , 23: 2, 2012, pp. 51-74. Romain Felli, “An Alternative Socio-Ecological Strategy? International Trade Unions’ Engagement with Climate Change,” Review of International Political Economy , 2013, pp. 14-18. National Energy Board, Canada’s Energy Future: Energy Supply and Projections to 2035 (Ottawa: NEB, 2011); Gavin Bridge and Philippe, Oil (Oxford: Policy, 2013), Ch. 1. Sean Sweeney, Resist, Reclaim, Restructure: Unions and the Struggle for Energy Democracy (New York: Rosa Luxemburg Stiftung/Cornell Global Labour Institute, 2012), pp. 11-12; Statistics Canada, Employment (SEPH) , Table 281-0024; Petroleum Human Resources Council of Canada, The Decade Ahead: Oil Sands Labour Market Outlook to 2021 , Spring 2012, at www.petrohrsc.ca. Thomas Mann, Some Responses to the Challenges of Climate Change by North American Labour , York University, Work in a Warming World, Working Paper, N. 2011-01, 2011; Carla Lipsig-Mumme, ed., Climate @ Work (Halifax: Fernwood, 2013). Mario Candeias, “Energy Struggles for Energy Democracy,” Rosa Luxemburg Stiftung, 2012, at www.alternativen.blog.rosalux.de; Sweeney, Resist, Reclaim, Restructure , Part 3. 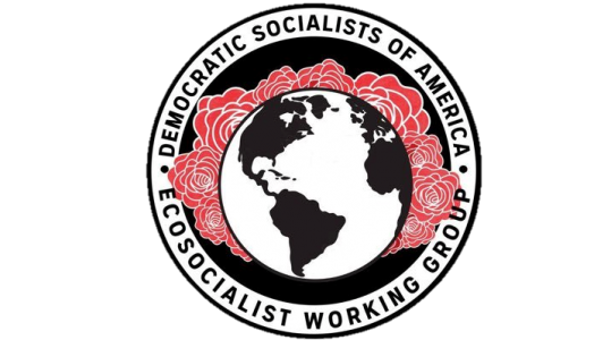 Andre Gorz, Capitalism, Socialism, Ecology (London: Verso, 1994); David Rosnick, “Reduced Work Hours as a Means of Slowing Climate Change,” Real-World Economics Review , N. 63, 2013; Climate Space/World Social Forum, “Change the System, Not the Climate,” The Bullet , No. 810, 2013. A term suggested by David Schwartzman, “Solar Communism,” Science and Society , 60: 3 (1996). But also see the discussion of the Leap Manifesto in “A Leap Toward Radical Politics?” The Bullet N. 1265, 7 June 2016. 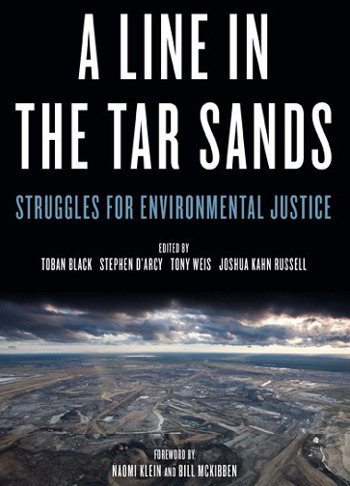 Lilian Yap is at the Department of Political Science, York University, Toronto, and is a contributor to the book A Line in the Tar Sands (Between the Lines, 2014).